Dear Business Partners, we would like to inform you about the following personnel changes which have come into effect on 1 April 2019. At the end of February, Czech Railways received the last of the twelve EffiShunter 300 locomotives ordered. CZ LOKO thus completed a significant contract whose performance started in September 2017. 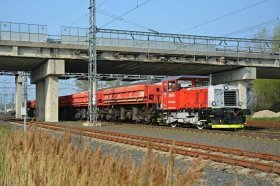 Czech Railways will use the new locomotives for shunting at stations and depots. They were purchased as a substitute for the not very reliable Class 714. In the specific operation of Czech Railways, they will be primarily used for passenger train arrangement and shunting for maintenance. CZ LOKO signed a contract with the Estonian national carrier Operail (formerly EVR Cargo) for the supply of packets for a comprehensive upgrade of four more C30 locomotives to Class C30-M. The contract was signed in the first half of January and will increase the number of upgraded locomotives of this class from three to seven. The extensive rolling stock of the ČEPRO joint-stock company has been upgraded with the new EffiShunter 600 locomotive made by CZ LOKO. CZ LOKO has been significantly successful in the Turkish market in recent months, when it succeeded in the tender process for the supply of shunting locomotives for the Isdemir steel plant. Based on a signed contract, six EffiShunter 600 locomotives will be produced next year. These locomotives will replace obsolete Soviet and Chinese engines, reducing the consumption of operating fluids, maintenance costs and increasing operator comfort. CZ LOKO will thus follow up on the supply of 744.704 – L18 and 744.705 – L19 Diesel locomotives that were received last year by the Erdemir steel plant, which, like Isdemir, belongs to the OYAK holding. CZ LOKO a.s., within its new strategic vision, made a change in the management of the subsidiary CZ LOKO Polska. The Chairman of the Board, Piotr Pytel, was replaced by Roman Stříž. CZ LOKO signed contracts for more EffiShunters at InnoTrans. It will supply them to more carriers in Italy and Hungary. In the middle of the week, two special vehicles designated MUV 74 M-S from the CZ LOKO plant in Česká Třebová are heading to Sofia. In the Bulgarian capital, the transport company Metropolitan Sofia will put them in operation in the metro during track maintenance. The first vehicle is equipped with a work platform for access to the overhead line. The other is fitted with a hydraulic arm and snow plough, as the metro line is partially routed on the surface. During September, staff training will take place in Bulgaria and the two vehicles will be put in operation. CZ LOKO completed the delivery of five EffiShunter 1000 locomotives to the Italian company MERCITALIA Shunting & Terminal (MIST) belonging to Gruppo Ferrovie dello Stato Italiane. This group, still under its previous name Serfer Servizi Ferroviari (SERFER), announced a tender for five shunting locomotives. The largest Czech car manufacturer renewed its locomotive fleet by receiving two new EffiShunter 500 locomotives from CZ LOKO. The acceptance took place on Tuesday, March 13, 2018, at the production plant in Mladá Boleslav, where both locomotives will be used for arranging whole trains with new cars. On 19 January 2018, CZ LOKO, a.s. delivered two more Class 741.7 locomotives to Dinazzano PO in Italy. The handover took place in Regio Emilia in the Emilia Romagna region, where both locomotives will be operated at local intermodal transport terminals. Hungarian carrier CER Cargo Holding expands its locomotive fleet with more locomotives from the Czech manufacturer of locomotives and special rolling stock CZ LOKO. The purchased locomotives are Class EffiLiner 3000 dual-system electric locomotive for CER Slovakia and Class EffiLiner 1600 diesel-electric locomotive for CER Hungary. The fourth and fifth EffiShunter 1600 locomotives have been delivered to the Fennia Rail company by CZ LOKO on 25 October 2017. The locomotives will carry the Finnish designation Dr 18. 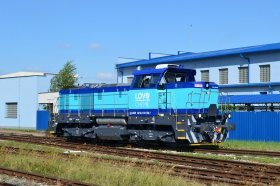 The biggest Czech producer of fertilizers, Lovochemie in Lovosice, supplemented its fleet of shunting locomotives with Class 741.7 produced by CZ LOKO. It is a fully modernized Class 740 engine from the locomotive fleet of Lovochemie, which, unlike its predecessor, provides site operators with a sharp reduction of operation and maintenance costs, mainly due to its high operational reliability and prolonged service cycles. National carrier Czech Railways (ČD) rejuvenates and increases the efficiency of its fleet of shunting locomotives, which provide shunting of passenger sets and units in passenger stations. Old, unreliable locomotives with much higher consumption and maintenance costs will be replaced by modern diesel-electric shunting locomotives produced by CZ LOKO. The locomotives or, more precisely, their diesel engines naturally meet the strict environmental limits of the European Union and are classified as STAGE IIIB. Hungary has become another member country of the European Union entered by Czech locomotive manufacturer CZ LOKO. The first customer is CER Hungary Central-European Railway Transport, Trading and Service Co. This major Central European freight railway carrier purchased the EffiShunter 1600 locomotive for heavy-duty shunting. CZ LOKO was awarded a contract of the Railway Infrastructure Administration (SŽDC) for the delivery of 50 new universal motor trucks (MUV) for a total of about 500 million CZK. The first one will be delivered in the autumn and the rest gradually over the next two years. The first electric line locomotive of CZ LOKO has its customer. Under the trade name EffiLiner3000, it is operated by the freight railway carrier IDS CARGO. The official handover took place yesterday in Prague. The win of CZ LOKO ended a global tender issued by the Italian company Serfer Servizi Ferroviari (SERFER) of the TRENITALIA group for the supply of five shunting locomotives. The tender took place from December last year to March this year and, from the group of competitors, it was the EffiShunter 1000 locomotive of CZ LOKO that was selected. Josef Gulyas Becomes General Director of CZ LOKO a.s.